Shipping: FREE 2 Day FedEx! 7” Touchscreen Chartplotter and Active-Image Sonar Ready! The Lowrance Elite 7 Ti2 combination unit leads the way to upgraded sonar technology and navigational features without breaking the bank. Built with a sunlight viewable 7 inch color touchscreen, the 7Ti2 can be mounted virtually anywhere. Perfect as a standalone plotter or combination unit, the Elite 7 Ti2 comes with preloaded 3-in-1Active Imaging Sonar functionality (transducer required/sold separately) and is a great addition to any console. Smartphone notifications, wireless networking and NMEA 2000 engine support are just some of the features that make this unit a must have system. Pair your smartphone with your Ti2 and receive texts and calls right on your screen. Don’t want to be bothered - don’t worry! Simply turn off the incoming notifications and you can enjoy your day on the water without texts and calls coming up. 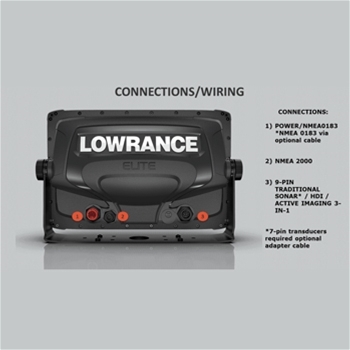 This Elite 7 includes both NMEA0183 and NMEA2000 networking and makes connecting to another NMEA compatible device a breeze. Although, not a fully networkable system, the Ti2 units can share sonar, mapping, waypoint and route data between 2 displays via wireless networking. Preloaded with CMAP Inland lakes, the Elite 7 Ti2 features 4,000 lakes with 1 foot contours and can be paired with C-Map Max-N+ charts, Navionics + or Navionics Platinum+ for even greater detail. With the addition of one of these charts you will also get the added benefits of automatic route planning. A menu activated plotting system that provides the shortest and safest course based on your boats specs makes navigating easier than ever. 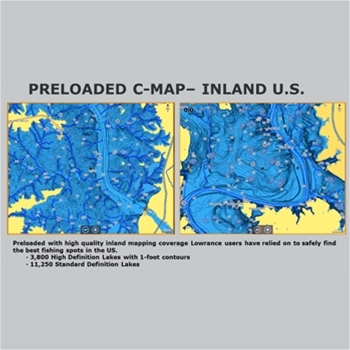 You can even update the maps of your favorite fishing spots with 1/2 foot contours via C-Map Genesis Live. Control contour transparency, contour density, depth and safety shading color palettes with Genesis Live and store all this info as you go to a microSD card. 3-in-1 Active Sonar Imaging when paired with a compatible transducer will provide M/H CHIRP, DownScan and StructureScan for exceptionally detailed underwater images. View below and to the left and right of your vessel in near photo like detail and see fish holding areas like rockpiles, standing timber, ditches and drop offs like never before! Plus when paired with a transducer you can update maps of your favorite fishing spot or create more detail with 1/2 foot contours in real time with C-Map Genesis Live. 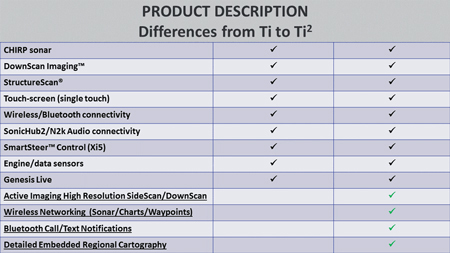 The Ti2 also allows touch screen control of Power-Pole anchors and MotorGuide Xi5 Trolling Motors. If you choose to utilize the Elite 7 Ti2 as a standalone plotter and later choose to add the transducer for dual uses, the Lowrance Elite 7 Ti2 has you covered with an out of the box functionality like no other. C-Map MAX-N+ Wide NA-Y022 East Coast and Bahamas for Navico. The Navico NMEA 2000 Starter Kit includes all of the parts neccessary to create a NMEA2000 Network on your boat. C-Map MAX-N+ Wide NA-Y026 Great Lakes for Navico. The Navico NMEA 2000 T-Connector is required for adding components to your network. It is installed on the backbone and uses one end of the T-Connector for the drop cable. C-Map MAX-N+ Wide NA-Y021 Canada North and East for Navico. C-Map MAX-N Wide NA-N024 US West Coast for Navico. C-Map MAX-N+ Wide NA-Y025 Canada West for Navico. C-Map MAX-N+ Wide NA-Y027 Gulf of Mexico and Central America for Navico. C-Map MAX-N+ Wide NA-Y028 Alaska for Navico. 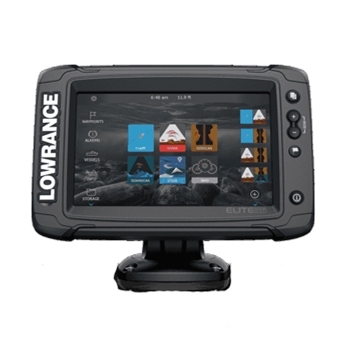 The Lowrance Elite Ti2 with a 7” high-res touchscreen display includes detailed Lake Mapping for the U.S., NMEA2000, wireless networking and smartphone notifications! Includes 83/200 Skimmer transducer, Active Imaging 2-in-1 Transducer and Y-Cable for simple connection.